Vitaly-TEA® (pronounced the same as “Vitality”) is a liquid tea containing pure distilled, de-ionized water and four organically grown herbs. (answered live between 9am – 5pm EST) or “Add to Cart” below. Purchase 1-3 bottles for $34 each. 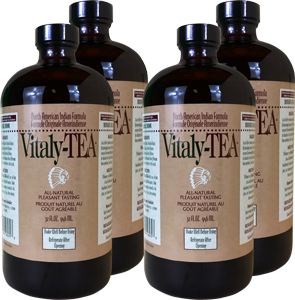 Save On Shipping TIP: With a weight of almost 4lbs per bottle Vitaly-TEA® is relatively heavy to ship. Due to UPS shipping cost dynamics, the cost for shipping two bottles (in a single box) is often only a fraction more than shipping one bottle. This means means your cost of shipping, per bottle is reduced substantially if you order two or three bottles versus one bottle. If you want to save on shipping cost-per-bottle think “two or more to a box!”. The maximum number of bottles that can fit in our shipping boxes is 4 bottles. 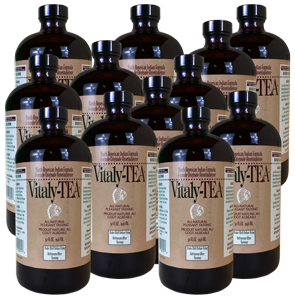 Save On Shipping TIP: With a weight of almost 4lbs per bottle Vitaly-TEA® is a relatively heavy item to ship. Due to UPS shipping cost dynamics, the cost for shipping two bottles (in a single box) is only a fraction more than shipping one bottle. This means means your cost of shipping the 5th bottle is reduced substantially if you order 6 bottles instead of 5 (because four bottles ship in one box and the 5th bottle goes into its own separate box, where per bottle shipping cost is highest). If you want to save on shipping cost-per-bottle think “two or more to a box!” The maximum number of bottles that can fit in our shipping boxes is 4 bottles. Save On Shipping TIP: With our 12-or-more quantity option, you’re getting THE LOWEST DELIVERED COST (in terms of per-bottle cost and per-bottle shipping cost) possible. 12-or-more pricing is highly recommended for customers who require 4 or more bottles per month. The maximum number of bottles that can fit in our shipping boxes is 4 bottles. International Orders to Hong Kong Only. ATTN HONG KONG RESIDENTS: To successfully process your online credit card order – please enter any 5-digit number in the “Zip/Postcode” field (i.e. “97464”). We do not ship Vitaly-TEA® outside the USA – with the sole exception of Hong Kong. Minimum order is 4, 8, or 12 bottles. International Shipping is by USPS Priority Mail Express International™ only . The maximum number of bottles that can fit in our shipping boxes is 4 bottles. To successfully process your online credit card order – please enter any 5-digit number in the "Zip/Postcode" field (i.e. "97464").